A fixed pulley has a fixed axle and is used to redirect the force in a rope (called a belt when it goes in a full circle). A fixed pulley has a mechanical advantage of 1. 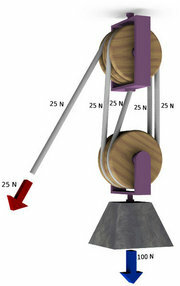 A movable pulley has a free axle, and is used to transform forces - when stationary the total force on the axle balances the total force provided by the tension in the rope (which is constant in magnitude in each segment). As illustrated below, if one end of a rope is attached to a fixed object, pulling on the other end will apply a doubled force to any object attached to the axle. 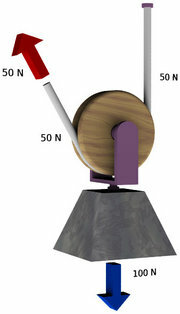 A movable pulley has a mechanical advantage of 2. A compound pulley is a system of movable pulleys. 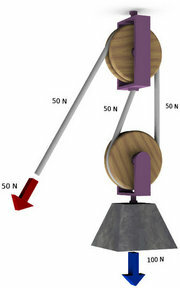 The mechanical advantage can be increased by using a block and tackle, where there are several pulleys on each axle. Plutarch reported that Archimedes moved an entire warship, laden with men, using compound pulleys and his own strength.